My thanks to Greg Goodman for submitting his first guest post at the Talkshop. It’s been a while since we discussed the role of the Moon in climate cycles and this analysis is a timely update. This subject will become more thoroughly investigated in a forthcoming paper and articles from Greg and others here. The author has a graduate degree in applied physics, professional experience in spectroscopy, electronics and software engineering, including 3-D computer modelling of scattering of e-m radiation in the Earth’s atmosphere. In trying to understand changes in climate it would be logical to look at the rate of change directly rather than trying to guess at and its causes by looking at the various time series of temperature data. It is important in attempting to untangle the various forces acting upon climate to identify the various effects and their causes and their long-term interactions. It is not sufficient to dismiss everything that happens in the climate system as “internal variation” and assume that it all necessarily averages out. There is plenty of evidence that many of these effects are not “internal” but driven by forces from outside. El Nino and La Nina are not symmetrically opposite and equal phases of the same process. Each operates in a very different way. The assumption that they all average out over any particular time-scale is spurious. The major oceanic basins have largely independent masses of water, at least in the upper levels. due to the large circulating currents referred to as gyres, driven by the Coriolis force . For this reason the major oceans are examined separately here. They are further broken down into their tropical and extra-tropical regions, since climate patterns are markedly different in the tropics. This helps in identifying underlying patterns that may be lost by the common, simplistic notion of global mean temperatures. A useful way to examine whether there are repetitive patterns in a data series is by examining the autocorrelation function. This is generated by overylaying the data on itself with a progressively increasing offset in time. The correlation coefficient being calculated at each step. This method does not assume anything about the nature or form of any repetition and so is not imposing or assuming any structure on the data. 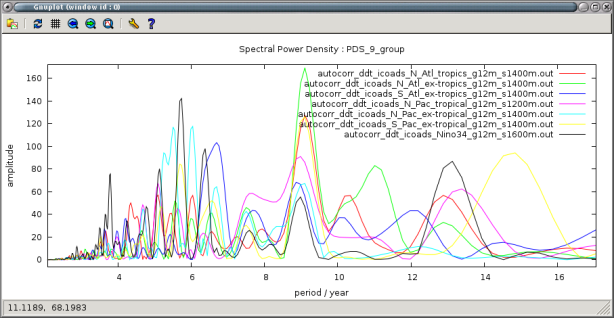 One way to extract the underlying frequencies is to look at the power density spectrum (PDS). This shows the strength of each frequency or band of frequencies. This is usually done on the square of the power. As already noted, dT/dt is a power term. The PDS can be derived by taking the Fourier transform of the autocorrelation function. Doing so reveals a large number of oscillations are present in all basins, many of them common to several basins. One problem with using the rate of change is that it amplifies shorter signals by 1/f and attenuates longer ones . The higher frequency terms, which in this context are the ‘noise’ of weather on the climate signal, get bigger. To prevent this h.f. swamping the signal of interest, a 12 month gaussian filter is used to attenuate the annual and shorter variations. Original ICOADS SST was chosen for this study since there are notable differences in the autocorrelation and the power spectra of the re-gridded, re-processed and “corrected” Hadley SST datasets. Examination of the literature detailing the calculation of the ‘climatology’ used in preparing HadSST3 (Brohan 2006 etc.) shows that crude running-mean filters are applied across adjacent grid cells to smooth the data and supposedly reduce noise. However, this implies both spatial and temporal phase shifts as well as introducing the frequency distortions inherent in using running means as a filter. This problem is aggravated since the process is repeated in a loop until the climatology “converges” to a stable result. There is no evidence in the associated papers that any assessment has ever been made as to the effect that this kind of precessing has on the frequency characteristics of the data but they are substantial. It would seem incumbent on the authors of such work to demonstrate that this heavy processing is improving the data rather than distorting and degrading it. In the absence of such a assessment, it was considered more appropriate to work with the unprocessed data from ICOADS which , while not being without it’s own problems, probably better represents the frequency structure of the historical record . This brief overview looks at groups of basins to examine the presence and period of common cyclic features. The following is an example for the North Atlantic and South Pacific oceans. It is clear that there are strong repetitive patterns in the data. In fact, it is surprising how similar these two basins are considering they are in opposite hemispheres and physically separate. Another feature that is instantly obvious to anyone with experience in signal processing is that there is more than one major frequency present. The recurrent dips in amplitude are classic signs of an interference pattern between at least two, closely related frequencies. The significance of the peaks and troughs in correlation depends upon the number of data used. So as the offset increases and there are less points that overlap and a given level of correlation is less significant (more possibly just chance). This is accounted for in the line showing 95% significance probability. The patterns are clearly of a significant level and not due to random variations. Earth’s climate is a very complex system of interactions so it is often more appropriate to think in terms of pseudo-cycles than pure simple harmonic functions, though the underlying physical mechanisms can often produce basic forces and reactions that would lead to harmonic oscillations in a simpler context. The power spectrum of the Nino 1 region, off the coast of Peru, is one of the least complicated. Notable, is the circa 13 year cycle and its second harmonic around 6.5 years. With the three nearby peaks around 5 years and the longer terms this will appear to be chaotic and unpredictable when viewed as a time series of temperature. But it can be seen to be highly structured once correctly analysed. Figure 2. 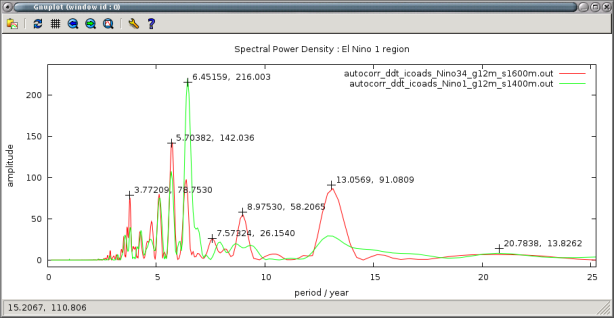 Power spectrum of El Nino 1 region. He calculated the following periods: 5, 5.9, 5.4, 65.6, 5.2, 131, 9.3, 10.8, 5.6, 13, 10, 11.8, 20, and 23.6 years in sun-spot number. In addition to Bart’s periods, which were solely related to solar cycle itself, not it’s effects on terrestrial climate, there is another reason to expect several higher harmonics to be present in SST data. When a radiative driver of climate, such as solar or CO2, varies there will an additional radiative forcing on the surface. This will instantly produce a rate of change of temperature. Once a higher (or lower) temperature is attained there will be a difference in emitted radiation and evaporation, two processes that depend upon temperature and provide a negative feedback. The temperature change will be the mathematical integral of the radiative forcing over time and will have a phase delay. In the case of a cyclic change, cosine will integrate to sine. The new radiative effect will, in turn, produce a change in temperature 90 degrees out of phase with the original, and so the loop repeats. There is a trigonometrical identity that sin(x).cos(x)=cos(2x) , so mixing such a rate of change with its integral in this way will produce a signal of twice the frequency: the second harmonic. and so on. An equal mix will produce just the harmonic, a more likely unequal mix will result in both fundamental and harmonic being present. So in the case of SST we should expect to find a series of pure harmonics being produced quite naturally. The very weak peaks 10.26 and 11.2 (not annotated explicitly on the graph for the sake of clarity, but visible) match the peaks at 5.15, 5.7 and a tiny 2.86 peak . These harmonics are indeed found to be very common. It can be seen that the short harmonics lose power in favour of the longer periods as the Nino/Nina patterns progress from the peruvian Nino 1 to the central Nino 3.4 region. Figure 3. Power spectra ensemble for basins sharing 9 and 13 year peaks. It can be seen that the 9 year cycle is clearly defined and stable. The 13 year shows greater variation between basins and is broader, showing more variation in the length of the pseudo cycle. 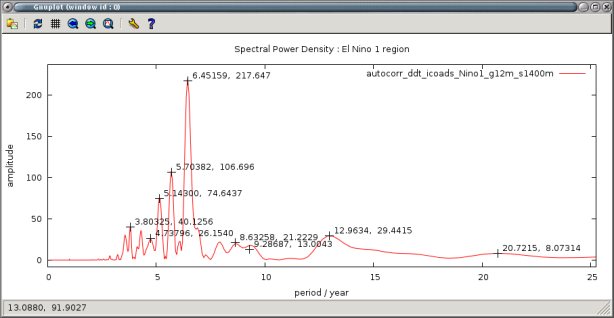 This is typical of the pseudo cycles in solar SSN data. Figure 4. 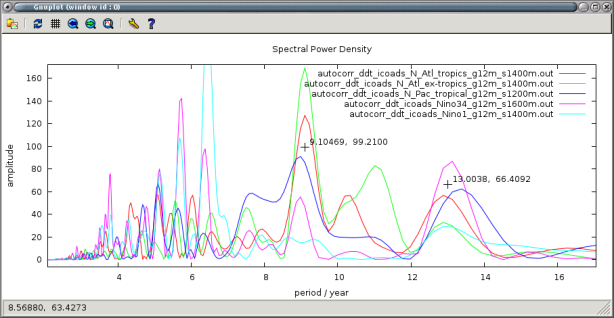 Collection of power spectra for basins sharing 9 year peaks. It is noted that the 9 year signal is prominent right across North and South, Atlantic and Pacific oceans in both tropical and extra-tropical zones. Figure 5. 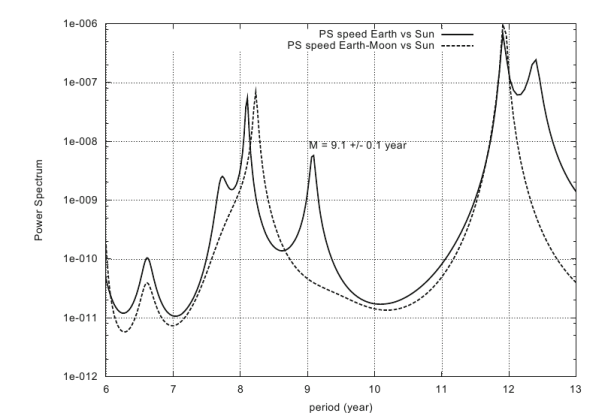 Nicola Scafetta’s graph  , derived from NASA/JPL ephemeris, demonstrating a circa 9 year periodicity in variations of the Earth’s orbital distance from the sun, caused by the presence of the moon. The results of the MEM spectral analysis shows a period of 9.1 +/- 0.1 that corresponds closely to periodic fluctuations seen here in SST. These are clearly distinct from usually noted 8.85 and 9.3 year lunar tidal periods. The presence of a strong 9 year cycle prevents a simple identification of a link between solar activity, as witnessed by sun-spot number ( SSN ) and surface temperatures. Figure 6 below shows a comparative graph. It can be seen that at the end of the 19th century the two cycles were in phase and reasonably in step with SST. By 1920 the individual peaks are seen interspersed as the cycles are totally out of phase. There is a phase crisis in the relationship with SST. By 1960 they are back in phase and, by the end of the millennium, can be seen to be once again diverging. This lack of any clear correspondence has often been cited as proof that there is no discernible link between global temperatures and SSN. 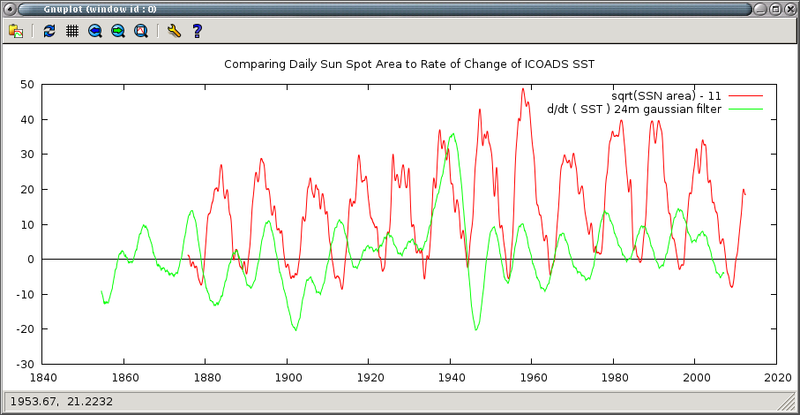 Figure 6 comparing rate of change of SST to sun-spot area. Little published work seems to exist on this apparently strong lunar connection to climate. Prof.Harald Yndestad  has published several papers on the subject that also provide strong evidence, however they are very restricted in geographical scope and draw conclusions that are limited to suggesting a regional effect. What is shown here is a much more significant, global effect. The presence of this strong 9 year cycle will confound attempts to detect the solar signal unless it is recognised. When the two are in phase (working together) the lunar effect will give an exaggerated impression of the scale of the solar signal and when they are out of phase the direct relationship between SSN and temperatures breaks down, leading many to conclude that any such linkage is erroneous or a matter of wishful thinking by less objective observers. Such long term tidal or inertial effects can shift massive amounts of water and hence energy in and out of the tropics and polar regions. 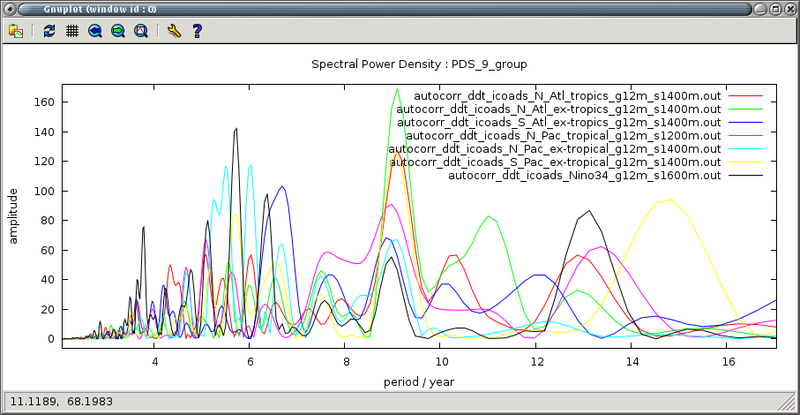 Complex interactions of these cycles with others, such as the variations in solar influence, create external inputs to the climate system, with periods of decadal and centennial length. It is essential to recognise and quantify these effects rather than making naive and unwarranted assumptions that any long term changes in climate are due to one simplistic cause such as the effects of trace gas like CO2. It is totally unfounded to suggest that these effects will simply average out over the time-scale of the current surface temperature record without detecting and characterising their form, duration and interaction. Even more so to ignore their importance in the much quoted “latter half of the 20th century”. Failure to recognise the importance of these not-so-internal cycles in climate variation likely accounts for the thorough failure of attempts to model and predict climate so far. Efforts which have now so obviously mislead our expectations over the first decades in which their predictions have been used to promote massive policy changes. Somewhat belated recognition that there are fundamental problems in current models has resulted in the recent reassessment of the projections made by Met. Office Hadley, from one of continued and alarming rise to one of five more years of non rising global temperatures following the last 16 years of no significant change. Further work is needed in identifying and explaining these variations to determine the role they have played in recent changes in surface temperature before attempts are made to predict future variations. ‘using 3:4’ is simply the data columns being plotted. SST data were obtained from KNMI archive. Early years with many gaps were removed and sparse gaps were filled by averaging same month from previous and following year. This is crude but for the small number of cases will not have noticeable effect on the spectra. Many thanks to Tim Channon for providing the software used for Fourier analysis. Finally to Steve Mosher for inspiring me to look into the question of celestial causes for climate change. For anyone not getting the Zen bit. The title I gave this article was “Lunar-solar influence on SST”. Tallbloke has taken a bit of licence in renaming it. The idea that both the sun and moon (yin and yang) play a role in these “harmonic” oscillations led to the Zen idea, which was the bye-line not the title. The harmonic mean of 8.84752821 (apse) & 9.30671523 (node/2) is 9.071314463. Title fixed as per Greg’s request. No ‘license’ taken, just thought the ‘bye line’ at the top of the copy I was sent was the title. Excellent. Amplifies Scafetta’s work and extends Keeling and Whorf. Looking forward to more. Thanks Paul. So that implies the N.Scafetta’s result was likely seeing the same thing. Insufficient resolution in these analyses to resolve the two peaks. N=??. Could you elaborate a bit on that part? I’ve been doing some work on this and have found that the equatorial Pacific is actually in a near-permanent La Niña condition – i.e. with a “cold tongue” almost always present in the Niño3.4 area – and that the only difference between a Niño and a Niña is that the amplitude of the cold tongue is lower than average during a Niño and higher than average during a Niña. There’s no fundamental change as we move from one to the other. Clearly a strong seasonal component is involved. Been looking a bit closer at the sun spot area data I used at the end there. Zooming in its more like 12.88 than the annotation of 12.84 but clearly the same thing again. Now is this common cause in SST and SSa or a direct solar effect? Apparent absence of 10.8 seems strange. 10.8 || 12.88 -> 66 year beats. Origin of “60 year” cycles? thx. the numbers give a suggestion but N is out at 30 AU ! What mechanism could give it any effect. Good question. From my fibonacci investigations, I would say that it may be coincidental with the timings of other planetary relationships closer to home. However, Neptune has an effect on solar inertial motion much larger than inner planets, and as you know, I contend that SIM shouldn’t be ignored, because the Sun is an extended wobbly mass of roiling plasma with energy pouring from its centre, rather than a nice neat point mass or elastic billiard ball. By having a considerably bigger mass and a much slower orbit. I don’t think you’re totally free of barycentre thinking here. Could you try to express mathematically what kind of effect you think matters ? Maybe I’m missing the point. J & N set the high frequency boundary conditions for the whole system: J+N ~= 11.07 & J-N ~= 12.8 — i.e. either side of J ~= 11.86. No other gas giant can produce sidebands so close to J as N can (because N moves slowest). There are hierarchically downstream echos in inner planet relations and in earth-moon relations. Greg, you should check out NASA JPL’s online ephemerides, called “Horizons”. It’s user-friendly. The 12.8 year signal on earth is related to polar motion (mass movement & ocean bottom pressure) and the earth-moon orbit — that is the immediate cause — in a hierarchically historic framework one can look out to the rest of the solar system to see what has shaped earth-moon orbital relations over time. Music to the ears. I recommend a careful reading of the Jean Dickey papers I reference here for deep insight into semi-annual & annual ENSO relations. Jean knows her stuff. I can think of few others who bring such clarity. Paul Vaughan says: No other gas giant can produce sidebands so close to J as N can (because N moves slowest). Ok, the numbers seem to fit which is tempting but that still leaves the question of how something that far out can have a physical effect. 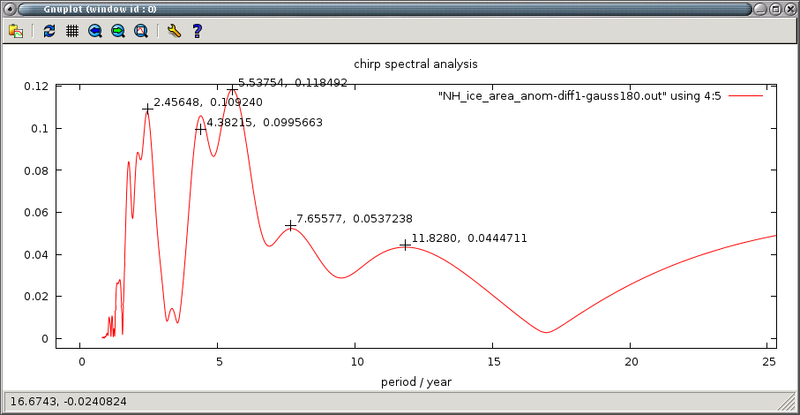 chirp analysis of Arctic ice area anomaly. This is the main region used to define PDO index. 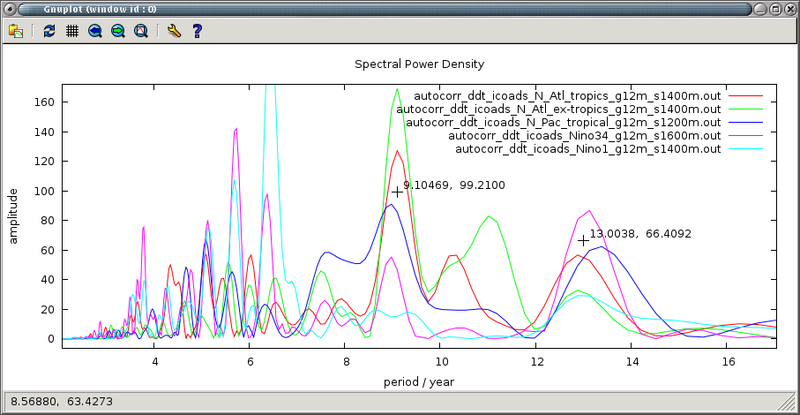 Much of spectra are essentially the same but there is a major difference around the important peaks for determining lunar and solar influences. There is no reason on the this trivial comparison to say which is “correct” but it shows the important changes produced by the Hadley processing, and there is a similar effect in N. Atlantic. As I said in the article, it is incumbent on Hadley to show that they are in fact enhancing and not destroying key information in the data. I have seen no indication that this has been assessed or even that the need for a such an evaluation has been considered. This comment is tangential to the topic, but since it has been intimated that not being ‘totally free of barycentre thinking’ is akin to not being totally free of scientific heresy in some quarters, I feel the need to answer. At least this can serve as a point of reference, putting to rest the wide spread mus-conception that things revolve around barycentres. According to the equations JPL use to construct their main ephemeris, all solar system bodies revolve around barycentres, notwithstanding small perturbations from their neighbours. The point of that thread was to demonstrate that the planets revolve around their respective barycentres with the Sun, not the solar system barycentre. Only the Sun itself ‘revolves’ (or ‘wobbles’) around the solar system barycentre; in a path determined mainly by the gas giant planets, including Neptune. This is not due so much to the gravitational force Neptune exerts on the Sun, as due to the motion of the Sun with respect to the changing combinatory disposition of the gas giants masses. The resultant is known as ‘Solar inertial motion’. Rather than embark on tediously tortuous mathematical proofs of these facts, I’ll simply point Greg to the relevant chapter of JPL’s documentation (thanks Wayne). 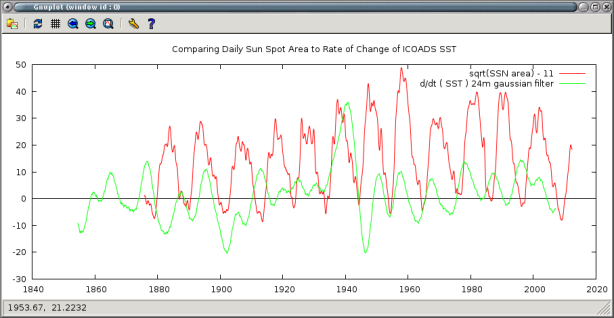 On this blog we have found many interesting correlations between the motion of the Sun with respect to the solar system barycentre and other phenomena such as variation in Earth’s length of day, changes in the hemispheric asymmetry of sunspot production, overall levels of solar activity and variations in solar wind speed and density. The underlying mechanism(s) are as yet uncertain, but the probability of all these phenomena coinciding by chance is vanishingly small. Many scientific theories are based on observations which enable the development of successful predictions, without the underlying mechanism(s) being known. Unlike some other blogs, we don’t dismiss as uninteresting phenomena for which no mechanism is evident. That would be an unscientific approach in our opinion. Follow the data. I find this your statement your most important, and the 9 years interval is a well known lunar interval; it can be measured with eclipses (1 solar, 1 lunar) on each side which have similar characteristics (see the 1/2 Saros (Sar) cycle); that is: [pairwise] opposite lunar phases have similar characteristics at 9 years distance (same season). The 9 year is a problem. I have been talking to Greg in private to do with the 9 year before the article was published, which goes back to the referenced Bart article. 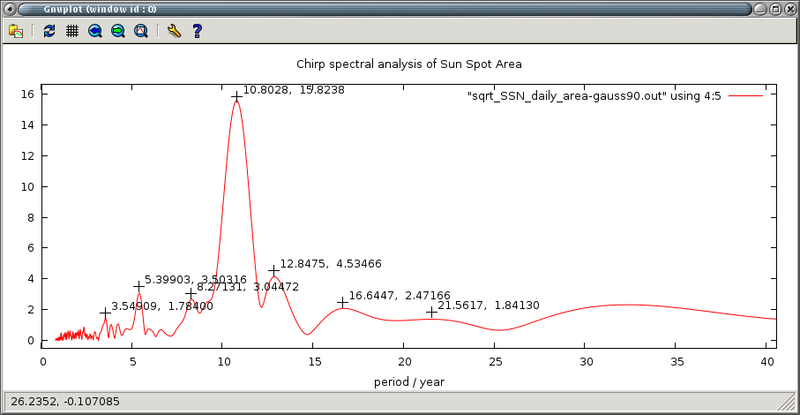 There is a strong 9 year in a _function_ of sunspot area, something I discovered quite a while ago. I noticed but wrote nothing. Greg mentioned the lunar 9 year. Now since I can use fancy software I checked and the lunar “9 year” is too different so on that I am more sceptical. In addition whilst the lunar periodicities are often talked about I have yet to see actual evidence they exist in more than human math patterns. The only clear long period signal in that is in the actual harmonics of the simple lunar earth orbit (ie. faster than orbit). This appears as very close doublets, which is closely spaced pairs of frequencies. These are extremely difficult to analyse, can do this as a party trick. Turning back to more normal earth data it is in a terrible state including improper sampling and data processing, such is the dire state of science and meteorology. I’m not sure we can unearth lunar in normal earth data, it is far too poor. Consider: how fast does earth tide move? Unless globally and contiguously there is competent data sampling at say 1 hour or better over extended periods, follow by correct data decimation (has to be in at least two dimensions to get global) there is going to be a mess. That leaves small subsets where I am not sure they will say much. I would be delighted if lunar could be clearly shown to be present, as it stands I have yet to be convinced. tchannon said: “The 9 year is a problem.” hey, very valuable information, thanks for the writeup. I’m not going to argue against heavy experience in the climate debate, but I want to learn about LOD and 9 years (also +1 month and so: Greg’s 9.1 years) opposite lunar phases. Yet at the time of this writing iers.org seems down (checked http://www.downforeveryoneorjustme.com/iers.org ) so this has to wait. B.t.w. 18.6 years would be 1/2 yrs too long for the Saros cycle; the Sar and Saros have virtually the same season at both ends. >> Next time you block me will be the last. > You’re right about that. The first time you blocked me was for the outrageous Lèse-majesté offence of using the word ‘magic’ that you are apparently over sensitive about..
[Reply] None of Greg’s comments have been ‘blocked’. Several days ago, the settings were changed for a few hours so that I could approve his comments before publication. I explained why I didn’t like the use of the word ‘magic’ and he said he understood the reason. I then took him back off moderation so he could post comments freely. Try that on Tamino or SkS or surrealclimate or even WUWT, where moderation is permanent. The second time was some ill-mannered, infantile foot stamping attempt at insisting I explain something on wikipedia that you are unable to understand. For some reason you think you can block all my other posts until I give you some private tuition. > from point mass = -1/d? Anyway, despite Greg refusing (in a very haughty way) to explain it, I worked out what his cryptic -1/d equation meant, and posted it on the Fibonacci thread. Rule (1) There are no rules. And mind your manners while you do it. TB [Reply] I’d probably have been easier going about the second ‘magic’ comment if you’d acknowledged you got your arse handed back to you on a plate for the first one involving powers of Phi. I asked the question, a valid question, for which you were able to give valid answer that added justification to the use of Phi**N which was previously missing. Hardly “getting my arse handed back to me on a plate”. Unwarranted abuse for which you did not have the manners to apologise. 1) Greg didn’t acknowledge the valid answer. 2) As I said above, when I explained to him in email why I objected to the ‘magic’ tag, he said he understood why I was sensitive to it. 3) He told me blunt Yorkshire folk like me should be able to handle a bit of joshing. It seems he likes to dish it out, but can’t take it back. 4) I won’t be needing lessons in manners from the man who told one of our German guests that he couldn’t write English well enough. You will doubtless censure this post and have your last word by exercising formidable powers of moderation so I’ll take screenshot before you do. [Reply] Nope, I’ll leave it up as a warning to other bloggers and publishers so they can get the measure of Greg. I also note your less than honest attempt to get people to vote for WUWT in a category where you are not present:, hoping to disingenuously increase your own changes in the science category. Lamentable. [Reply] Blimey. Greg has worked himself into a lather of conjecture. Anthony asked me to give him a Bloggies plug in exchange for use of the graphic. It’s a bit of fun is all. So, Roger, clearly “There are no rules.” is a lie and you don’t even have the good manners yourself that you ask of others. You have a child-like, defensive and dishonest moderation policy like many of the alarmist sites such as Tamino’s Closed Mind , Non-Skeptical Science and un-Real Climate. [Reply] This isn’t true either. None of Greg’s comments have been censored. Neither has he been ‘blocked’, though he did go on moderation for a few hours. That’s a shame. I have generally found ‘sceptical’ site to be more honest. Open and objective scientific discussion is not possible in such an atmosphere, so I will save my time for posting on more serious scientific forums of debate. best wishes and good luck to those who wish to continue in such an environment. [Reply] It looks like Greg prefers to flounce rather than accept his arse on a plate again – this time re barycentric orbits and solar inertial motion. Some people just can’t admit when they’ve got it wrong. Especially not to themselves. Not even when you give them the relevant JPL documentation to read. Try to debate the existence of tides with a mariner and see what kind of reaction you get. Point of clarification: That’s the Lunar Nodal Cycle, not Saros. Saros is related but differs. I advise a review of definitions. If you can find time, please share an article on this. You’ve misunderstood. Richard Gross (NASA JPL) speculatively points to proximate lunisolar (not solar system) causes of the frequency. I’m cautioning you about confounding. There’s a hierarchically historic framework. Earth-moon relations are and have been shaped by the solar system. This isn’t controversial. You’ll need to do some homework. I’ve prepared a document to streamline such an exercise. See the summary of confounding I give in section II here. I checked Tim’s claim about 9a power in sunspot area. Indeed there’s strong 9a power in N-S. There’s a long wave in N-S from the early 1940s until the early 1990s. That’s about 50 years. Something that’s not reported in the literature: Both |N-S| (the absolute magnitude of asymmetry) and high frequency volatility in N-S are very strongly related to N, S, & N+S. 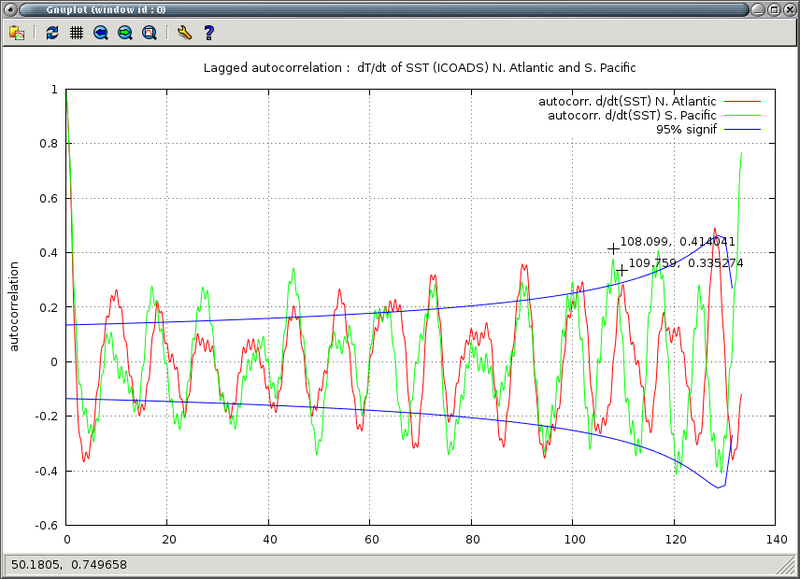 If a ~50a wave beat with |N+S| (~11a period), that would give a positive sideband at 9a. For readers who want to have more fun & adventure: (J+N) beats with (J-S)/4 to give 9a (to within ~2 days). Seems a good recipe for a strong Nino signal. On the other hand the average solar cycle length over the same interval was ~10.65 years and Marcia Wyatt’s 64 year wave (measured using MSSA) would split that into 12.8 & 9.1 years. I’m not drawing any decisive conclusions on this today, but Greg’s 9a signal does demand an explanation. I’ve never looked at ICOADS data. If/when time permits I will. IMO we next need to see the 9a power as a function of time. If anyone does a follow-up post on this I suggest starting with that. Apologies for mixing notation: Above where I write about sunspot area, N & S are for north & south. Elsewhere N & S are Neptune & Saturn. I’ve just checked Greg’s strongest 9a signal: N_Atl_xT=70W-10W_20-60N. Temporally-global summaries (i.e. summaries that lump the whole time domain together as if all eras are uniform) can be severely misleading. Justification for lumping everything together can only come from windowed diagnostics. In this case, the diagnostics clearly indicate a severe failure of the temporally-global modeling assumptions. Reminder: This is for the strongest 9a signal presented in the article. Still, I’m a careful auditor. I’m not going to assume everything else presented here is wrong. This was just the first thing I looked at. I’ll keep looking when I have time. Above was for ICOADS air T.
There’s temporally-global 9a power only if intermittent 9a signals are blended together. So the power’s not always there, but you can make it look like it is. That doesn’t mean the signals aren’t informative. Intermittent signals of common period observed in multiple basins: That’s interesting and it shouldn’t be ignored. The next thing I would do is redefine the spatial regions. For example extratropical western boundaries differ substantially from their eastern counterparts. I don’t suspect much more can be learned from such reorganization since the more general exploratory strategy being applied here is so inefficient (e.g. it chases poorly constrained metrics without using a network approach), but I’ll check anyway to be thorough. Greg raises substantive concerns about the impact of clumsy data processing. Authorities should take these concerns seriously. Running means are technically anchored at one end, whereas moving averages are not. The term running mean has been misapplied so extensively that for many it has become synonymous with moving average. There’s a difference between the 2 terms, so we should distinguish. For example, the distinction becomes important when teaching central limit theorem, which is quite an important concept. Gents, thanks for your research effort and insightful comments. Tim C: When I researched the Greenwich sunspot area data a few years ago, I found a correlation between North-South asymmetry and solar inertial motion in the Z-axis (in which Neptune plays an important role). However, because I was having to average the data over longer periods to deal with the dominant signal from Jupiter, I missed the 9yr cycle in the data. I’ll revisit the cleaned series you kindly sent me. 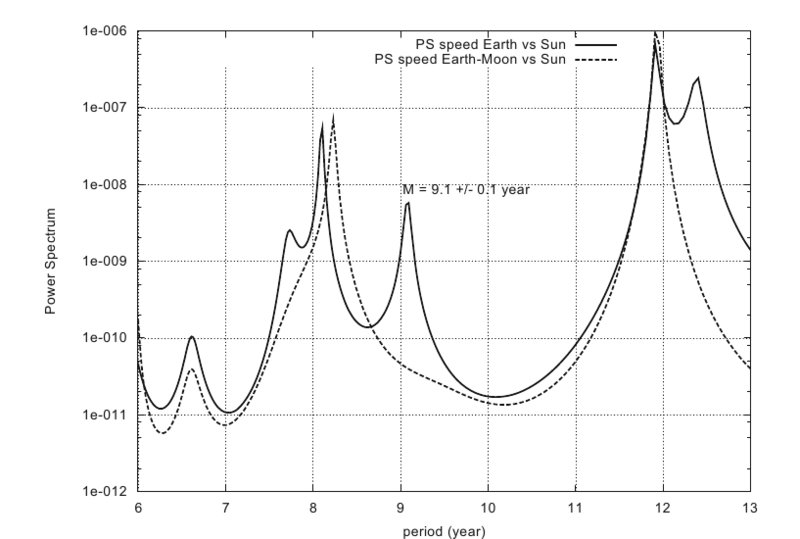 Paul V: Do you think the intermittent nature of the signal could be partly due to the lunar declination cycle? It seems to me that physically, this is the second largest Lunar variation after the monthly cycle of Luni-Solar alignment. I realise tides are complex phenomena, and continental masses further muddy the picture but would it be possible to check for this by looking to see if the signal moved from nearer the equator to further into the extra-tropics over the 18.6yr cycle (for example). Ulric: One of the sharpest changes in the X-Y planar motion of the Sun relative to the SSB over the Jose cycle (~178yr) took place in 1993. This is where the ‘Neptune effect’ is strong. It’s alignment relative to the other gas giants causes the Sun to cross the SSB and then abruptly reverse. The effects are not necessarily immediate, but I think it may be important. The Z-axis motion correlates with solar activity, but with a lag similar to the length of day lag behind the planetary motion (around 30yr). The small reversals in radial distance that occur near the solar surface seem to relate to the onset and end of deep solar minima such as the Dalton, and maybe right now too. 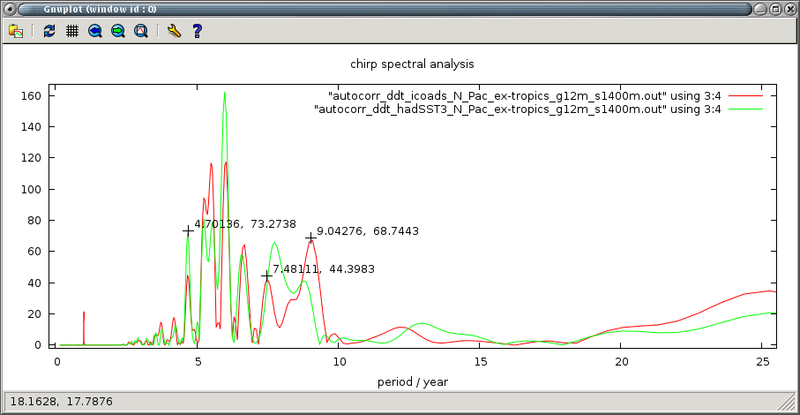 Alert: KNMI’s wavelet tool specifies extent in wavenumber rather than years. It has grain & extent forcibly coupled. This means the “a” (years) should be dropped where I list links to graphs — e.g. “11a” should read simply “11”. TB: A network approach might be a way to get a handle on the intermittency dynamics. I don’t yet have enough info to speculate productively. I’ll let you know if that changes. Paul, let me know if I could help with the donkey work. I wonder if we would be permitted to script requests to knmi for the plots. TB, the only thing that really stands out as I vary the region definitions is familiar changepoints. That’s not surprising. I wanted to know if the temporally-global summaries were misleading. They are. I had never looked at ICOADS, so I wasn’t willing to assume. If the summaries were persistent across all time, I wanted to know because that would be exciting. They’re not. I’m now content to step aside let someone with serious computing power continue the exploration. Paul, many thanks again for your time, and for showing us a neat way to get those plots from knmi. tallbloke, they were in quadrature in 1993. I’m looking at immediate effects at the Ne-Ju syzygies. Ulric: no problem, I was just letting you know what I’m looking at. Both approaches might lead somewhere I hope. Paul Vaughan says: No other gas giant can produce side-bands so close to J as N can (because N moves slowest). Greg says: OK, the numbers seem to fit which is tempting but that still leaves the question of how something [Neptune] that far out can have a physical effect [upon SSB]. the precession rates for the line-of-nodes and line-of-apse of the lunar orbit. When these resonances have occurred, they would have greatly amplified the effects of the planetary tidal forces upon the shape and tilt of lunar orbit. Hence, the observed synchronization between the precession rates of the line-of-nodes and line-of-apse of the lunar orbit and the orbital periods of Venus, Earth, Mars and Jupiter, could simply be a cumulative fossil record left behind by these historical resonances. (8.85 years)). Hence, cumulative influence of the planets upon the shape and tilt of the lunar orbit over more than 4 billion years has indirectly set the properties of the lunar tides and these in turn have influenced the properties of the Earth/ocean/atmosphere system. the possibility the source of excitation for the Chandler Wobble might have an extra-terrestrial origin. It is possible that the 6.40 year realignment period for the terrestrial planets has interacted with the sidereal orbital period of the Earth/Moon system over the eons, to produce a side-lobe modulation that it has slowly nudged the precession rate of the line-of-nodes of the lunar orbit towards its current value. Hence, we now have a precession rate that produces a 2nd harmonic for the maximal changes in tidal stresses that varies on a time scale of 1 ¼ TD = 433.2751 days = 1.18622 years. Deliberately choosing old results here. errata: s1992/1962/, well it is me. I have some problems with the wobble data which are unresolved, in essence something seems to have changed. Long stories not for here. No-one jump on this as significant to earth systems, it is a tiny effect which even today is hard to measure. IIRC, something like 40 metres movement in a year. No data I know of doing the whole thing, ought to be 3D. Tim, I profoundly disagree that it is a tiny effect. I invite you to consider the energy required to tilt the earth’s entire rapidly spinning mass 40m off axis at the surface, and the pressure waves and mixing this will induce in the inertially massive global ocean which is spinning at 1000mph, and doesn’t particularly feel like changing direction. Fabulous comment from Ian Wilson, now posted as a new article. The 9 year signal is the Earth-Venus-Saturn cycle. Come on then big boy, show us. The analogy is the relationship that Earth and Venus have with Jupiter and the sunspot cycle. Earth and Venus syzygies line up with Saturn every 9yrs, so the effects of all three together will peak at that period. Hindcasting through CET shows the synthesis of the angular relationships of the three bodies to be one of the dominant drivers of monthly to seasonal temperature deviations. Ulric’s assertion that SEV has a period of ~9 years is correct. From theory I just calculated this using the same method I’ve demonstrated in the past to get ~11 years for JEV. So we should work by analogy and look for UEV & NEV. I’m in a rush, so this will have to wait until another time. Simple & easy even when in a rush. Thanks for the tip Ulric. U+E/V is ~ 5.01988yrs on average, but in practise in the short term it’s variable, it goes 6 then 6 then 7 Ea/Ve syzygies. U+E/V is also very resonant with the Venus transit cycle which is 152 Ea/Ve synods, particularly at 19 Ea/Ve synods. While Ju+Ne synods are in tune with 8 Ea/Ve synods. 19*8 = 152. Ulric, your notes are appreciated. I was hoping you would share. I made an error above actually, looking at Ea/Ve synods and Ur, they meet at 6-6-7 Ea/Ve synod intervals, but from syzygy to syzygy it’s pretty messy, better alignments of all three ranges from 2 to 7 half Ea/Ve synodic periods. Nice art work – where’s the data? Or was the fit to the data so bad you were embarassed to show it? How did you eliminate the red noise? The results will vary somewhat with the algorithm. FFT assumes a stationary signal. It’s hard for me to assume that approximately 100 years of temperature data is stationary. I would argue it’s most likely where most of the power in the signal resides – in the red noise. The horizontal axis has units of period/year – a dimensionless parameter. 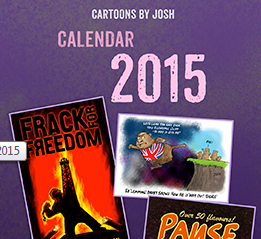 I’m presuming you meant period (year). Agile Aspect, the more interesting thing coming out of this thread relates to Tim Channon’s comments on solar heliographic asymmetry, so I’m thankful that we had occasion to be having a discussion. TB: Tamino’s made a few mistakes of his own in criticizing Greg. Of course that doesn’t mean there’s persistent 9 year power in ICOADS SST (there’s not) and it also doesn’t mean Greg should be crossing a line by posting private e-mails on your blog! Yes it should be intermittent, in fact there should be a stronger signal at 18yrs, but this will more likely be visible in land temperatures and precipitation. Ulric the repeating patterns in global surface weather are the basis for the forecast maps shown on my site. They show the repeating patterns composite average of the last four 6558 day long cycles. Hi Richard, yes I did know you work with roughly an 18yr analogue. I still think it’s a solar signal and not a Lunar one. Are we back to a 17yr solar wind cycle here Ulric? No, ~18yrs, to do with the Sa+Ea+Ve cycle. The 17yr stuff is a very brief signal that you can only spot in long strings in some months on CET. Ulric if every night on the way home from work a guy on a motor cycle shoots a couple times at my house, would I become safer if I take away the motor cycle or the gun? Ballester, J.L. ; Oliver, R.; & Carbonell, M. (2005). The periodic behaviour of the north-south asymmetry of sunspot areas revisited. Astronomy & Astrophysics 431, L5-L8. Tim Channon has some reservations about the limitations of the methods they use and suggests something closer to 8.9 years. Plenty more to say about HMF structure moving forward. There’s so much fascinating information in that time series that rarely gets discussed. What’s the x-axis of Figure 1? Greg – cool stuff. Yea it’s a year later, and I’m way behind you guys here, but anyway… I saw how Dr. S told you to wash your mouth soap (LOL) when you responded to my comment about how a better plot of historical temperature would be versus the integral of either SSN or flux…. I am working on that slowly, without much progress yet, but I’ll keep at it time permitting. I’m glad to see you here working with the Talkshoppers. Bias in solar activity, the combination of Hale, Wolf and Wolf-Gliessberg cycles.